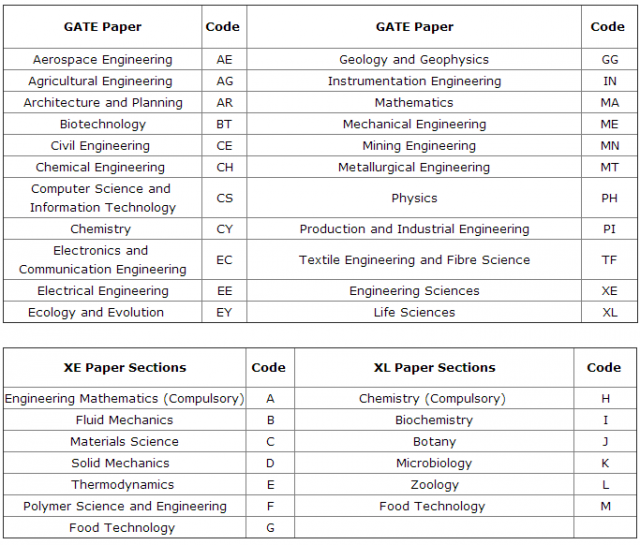 For the GATE 2017 examination, a candidate can apply for only one of the 22 papers listed in Table. The syllabus for each of the papers is given separately. Making a choice of the appropriate paper during GATE application is the responsibility of the candidate. comprise of Sections listed in the above table. In all the papers, there will be a total of 65 questions carrying 100 marks, out of which 10 questions carrying a total of 15 marks are in General Aptitude (GA).In the papers bearing the codes AE, AG, BT, CE, CH, CS, EC, EE, IN, ME, MN, MT, PI, TF and XE, the Engineering Mathematics will carry around 15% of the total marks, the General Aptitude section will carry 15% of the total marks and the remaining 70% of the total marks is devoted to the subject of the paper.23 In the papers bearing the codes AR, CY, EY, GG, MA, PH and XL, the General Aptitude section will carry 15% of the total marks and the remaining 85% of the total marks is devoted to the subject of the paper. (ii) Numerical Answer Questions of 1 or 2 marks each in all papers and sections.For these questions the answer is a real number, to be entered by the candidate using the virtual keypad. No choices will be shown for this type of questions. a)Verbal Ability: English grammar, sentence completion, verbal analogies, word groups, instructions,critical reasoning and verbal deduction. b) Numerical Ability: Numerical computation, numerical estimation, numerical reasoning and data interpretation.